Stand up paddle boarding is a surprisingly easy and very fun water sport that gives you a unique connection to nature. Don’t be intimidated — anyone can do it. And you’ll get good a core workout while you burn some calories! SUP Workout: How Many Calories Will You Burn? Although it has some ancient roots in the fishing cultures of South America, the Middle East, and Africa, modern stand up paddle boarding was really born at Waikiki Beach, Hawaii in the 1940′s. But it didn’t truly catch on until it was imported from Hawaii to the mainland U.S. by Rick Thomas in 2000. So it’s a relatively new sport that has becoming increasingly popular. Paddle boarding is not only fun, but it’s also a great way to connect with your surroundings. It’s a peaceful and relaxing way to feel close to nature. You get a wonderfully unique perspective on the water, since you are virtually standing on it. It’s quite a rush to see a sea turtle or a school of fish swimming underneath you! SUP can also be very social. You’ll often see groups of two or more boarders heading out together, and it’s pretty easy to stay close enough to carry on a conversation. SUP looks difficult. But it’s really pretty easy to get started. Everyone thinks they are going to fall off the board, but almost no one does. I’ve loaned out my board to dozens of first-timers and none of them have ever fallen. But to be safe, you should certainly plan to get wet and dress accordingly — wear a bathing suit, take your cell phone out of your pocket, and remove jewelry or anything else you don’t want to get wet. First, you need a calm, flat body of water. The ocean will work fine on a calm day as long as you can get safely past any waves, or if you have access to a protected bay or cove. A river might work, but only if there is a long, large, calm and very slow-moving stretch. A calm lake is usually your best bet for getting started. Once you have found a place to practice, you need to buy, rent, or borrow a board and a paddle. The paddle should be about 6 to 10 inches taller than you. It’s important to get the right paddle. Many are adjustable, but some are a fixed size. Be sure yours is in the right height range. Once you start paddling more regularly, you’ll figure out exactly which paddle length is best for you. If the water is cold, you will also need a wet suit or dry suit so that you don’t get hypothermia if you fall in the water. Now you’re ready to go. Be careful of the fin(s) on the board as you get into the water. If you are caring the board, be sure to carry it out far enough to avoid hitting the fins on the ground — you might break them. If you are floating the board, float it upside down (fins up) whenever you are near shore. Once you are in deep enough water, climb onto the board. You can lay the paddle on the board or hold it in one hand as you climb onto your knees. Hold the side edges of the board (called the rails), to balance yourself. Then slowly rise to your feet, one foot at a time. You want your feet to be in the center of the board lengthwise — usually near the handle. Center your feet between the rails (sides of the board), about hip or shoulder length apart. You (and your feet) should be facing forward — don’t stagger your feet like a surfer on a surfboard. Once you are on your feet, you can start paddling. You will need to alternate strokes, like paddling a canoe. Paddle a few strokes on one side of the board, then a few strokes on the other side. Hold the paddle with your outside hand part way down the shaft and your other hand firmly gripping the handle on the top of the shaft. For example, if you are paddling on the left, your left hand will be on the shaft and your right had will be on the handle. Reach forward a little, put the blade in the water, and pull the paddle back towards and then then slightly behind you to complete a stroke. Try to keep the paddle as vertical as possible and keep it close to the board. If the water gets rough or if you have trouble keeping your balance, you can get back on your knees and paddle like a canoe. That’s a safe and easy way to get back to shore. On your way back to shore, be sure to climb off the board and float it upside down before you get too close to land. You don’t want to risk breaking off a fin. Paddle Boarding Workout: How Many Calories Will You Burn? Stand up paddle boarding will improve your balance and give you a great core workout. If you’re aggressive, you’ll also get a decent full body workout — especially on your arms and shoulders. How many calories will you burn? That depends on how aggressive you are. Unless you are racing or really pushing yourself, SUP tends to be a somewhat more leisurely activity. At a typical casual pace, you’ll burn about twice the calories you’d burn on a moderate paced walk (2.5 mph). Compared to going for a run, it’s about the same as running 13 minute miles (4 mph). See the chart below for your specific calorie burn, which varies depending on your gender and weight. SUP is a fun and relaxing way to get some exercise and enjoy the outdoors. It’s fun to do with friends, and it’s also a great way to decompress and get some time to yourself. It’s easy to get started and it’s easy to do. 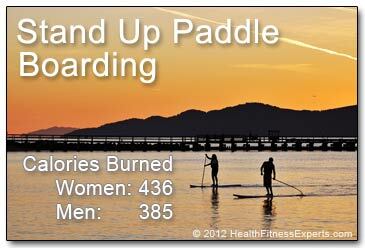 So give stand up paddling a try. You won’t be disappointed! Do you stand up paddle or have you given it a try? Do you enjoy it? Do you have any advice for people just getting started? Share your comments below and let us know! Stand Up Paddling: Flatwater to Surf and Rivers.